CARLA project staff and invited guests have offered a wide variety of conferences, workshops, institutes, and presentations. To find out more about what has been offered through the center, please see the database of publications and presentations. Browse a list of previous CARLA Presentation Series events. Finney, S. (2019, April 10). "Creating an Immersive Language Learning Experience through Role-Immersion Pedagogy." This presentation will share findings related to student perceptions of a US-Mexico border role-immersion pedagogy carried out in an intermediate Spanish course. Role-immersion pedagogies aim to bring a highly contextualized alternate reality to life in the classroom in order to create an immersive and experiential learning encounter. In this five-week study, learners explored diverse perspectives related to the issues of drug trafficking and violence at the US-Mexico border, adopted and developed real-world cultural identities, and ultimately worked jointly to achieve individual and collective goals focused on curbing these complex problems. The qualitative data shared in this presentation will focus on student impressions of the pedagogy and how the process of understanding and enacting an alternate subjectivity contributed to these impressions. The presenter will conclude with implications for foreign language curriculum design. Sara Finney is the Intermediate Spanish Coordinator in the Department of Spanish and Portuguese Studies. Her research interests include foreign language pedagogy with a focus on learner agency, experiential learning, and intercultural empathy. de la Fuente Iglesias, M. (2019, March 28). "Effects of Cognate Status on the Acquisition of Spanish Stops by College Students"
While the study of /p, t, k/ in learners of Spanish has been addressed quite extensively, the cognate status in the realizations of stops has not received as much attention. Previous studies have limited their analysis to the production of /t/ and have found mixed results. This presentation explores the development in the production of the voiceless stops by differing levels of learners of Spanish to determine whether lexical items that are orthographically and phonologically similar (cognates) and lexical items that are not similar in form (non-cognates) enhance cross-language phonetic interferences. The study also includes a control group of native speakers of Spanish. Using data from a reading aloud task, the results indicate an effect of cognate status, particularly for advanced learners, who overall have acquired a native-like pronunciation, but still do not display an optimal production of cognates. Implications of the findings will be discussed for models of bilingual speech processing. Mónica de la Fuente Iglesias is a PhD candidate in the Hispanic Linguistics program in the Department of Spanish and Portuguese Studies. Her main research examines effects of language contact between Spanish and Galician in Spain. She has also researched several areas including morphology and experimental phonetics in the field of Spanish second language acquisition. This presentation is cosponsored by the Department of Spanish and Portuguese Studies. Goodspeed, L. (2019, March 7). "Exploring the Meaning-Making Choices of Collegiate French Learners Through Genre-Based Writing." In foreign language (FL) instruction, the role of writing is often limited due—in part—to the fairly prevalent belief that successful FL texts are characterized primarily by accurate language. Scholars, however, have challenged this belief by insisting that FL writing also has important cognitive and sociocultural dimensions that must be attended to through classroom instruction (e.g., Byrnes, Hyland, Kern). Two pedagogical approaches that account for these dimensions are multiliteracies and genre pedagogy; yet, empirical studies that address how FL learners develop awareness of the multiple dimensions of successful FL writing remain quite limited. The study presented in this talk explores the written meaning-making practices of 25 lower-level collegiate FL learners by focusing on the reasons for which they drew on model text resources in their genre-based tasks. Qualitative analysis of text-based interviews showed that learners used model texts for a variety of reasons that reflected the linguistic as well as the cognitive and sociocultural dimensions of writing, highlighting the importance of model texts for FL learners' development of multiple literacies. Lauren Goodspeed is a Lecturer in the Department of French and Italian and Coordinator of French 1002, 1022, and 1003. Her research centers on applications of multiliteracies pedagogy for the foreign language classroom, particularly in regard to second language writing. Simonsen, R. (2019, February 13). "We're Far from the Shallow (Structure Hypothesis) Now: Exploring the Depths of Non-native Spanish Sentence Processing." The Shallow Structure Hypothesis maintains that second language learners do not process sentences as fully as native speakers. In other words, they process grammatical information in a "shallow," incomplete way. However, it is not clear if second language learners are forever restricted to shallow processing, as the Shallow Structure Hypothesis predicts, or if learners can in fact overcome their non-native processing patterns with advanced proficiency. In this presentation I discuss the results from a cross-sectional self-paced reading study in which I examined the sentence processing strategies of three groups of second-language Spanish learners: fourth-semester students, Spanish minors/majors, and people with an MA or PhD who use Spanish professionally. Specifically, I documented learners' sensitivity to variations in word order and verb type in sentences. Through a comparison with a control group of native Spanish speakers, it was clear that fourth-semester students and Spanish minors/majors exhibited shallow processing. The group of participants with an MA or PhD, however, processed sentences in a native-like way; in real time, they were able to use word order cues to make predictions about the type of verb that would appear in a sentence. This study demonstrates the importance of considering a wide range of language proficiencies when formulating hypotheses and theories in SLA. Second language learners may only be restricted to shallow processing until they reach a considerably high threshold of proficiency—one which they are not likely to attain during their college years. Russell Simonsen is a PhD candidate in Hispanic Linguistics in the Department of Spanish and Portuguese Studies. He specializes in second language sentence processing and foreign language pedagogy. Hoffman-Gonzalez, A. (2019, February 6). "Subtle Bias? Spanish Teachers' Beliefs About Dialectal Variation." This qualitative study conveys teacher attitudes toward the teaching of language variation by approximately 90 K-16 foreign language teachers in the USA. These same teachers also answered questions about their use of dialectally variable features in the classroom. Analysis of both open-ended and multiple choice questions reveals conflict between teachers´ claims about best classroom practice and actual practice as well as conflicting opinions about dialectal variation in the language classroom. Anne Hoffman-Gonzalez is a Lecturer in the Department of Spanish and Portuguese Studies at the University of Minnesota where she regularly teaches all levels of Spanish language and Spanish linguistics courses. Her research focuses on the use of dialectally variable features by nonnative speakers and native speakers in second dialect situations. She has presented her research at national and international conferences such as LASSO and AAAL. Tarone, E., & LaScotte, D. (2018, November 28). "Narrative Voices: Learners Shift Accuracy and Fluency in Protagonists' Speech." This research study supports the idea that heteroglossia contributes to language learning in second language acquisition theory and bilingualism. Bakhtin's (1934/1981) theory of heteroglossia differs from sociolinguistic constructs of variation in claiming that when acquiring a language, one internalizes different 'voices' of others, where 'voice' includes not just linguistic units, but also others' suprasegmentals, nonverbals, and social stances. The study analyzes speech samples from adult learners of English at different developmental levels as they engage in language play to produce narratives in their own voice, and as part of those same narratives, produce episodes of constructed dialogue that imaginatively recreate the 'voices' of their protagonists. We demonstrate important shifts in accuracy, complexity, fluency, and other features of learner language as the learners shift from their own voices to those of their protagonists, and we use a variationist and heteroglossic theory of second language acquisition to argue that all these voices form a part of their interlanguage competence. We claim on the basis of these findings that language play in constructing dialogue in oral narration is facilitative of SLA, and should be used more in classroom L2 pedagogy. Elaine Tarone has published extensively on variationist approaches to second language acquisition; a retired professor at the University of Minnesota, she is a past director of CARLA. Darren LaScotte is a Teaching Specialist in the Minnesota English Language Program and in the Department of French & Italian. Within the broader scope of applied linguistics and sociolinguistics, his research interests include language teaching practice, language play, and learner language variation across social contexts. Soneson, D., Strawbridge, A., & Griffith, C. (2018, November 13). "Impact of High School Study on Post-Secondary Foreign Language Proficiency." To what extent does exposure to formal language learning at the secondary level affect language proficiency at the post-secondary level? Are there differences among students at the same stage in the second-language program that can be attributed to pre-university experience with the language? The Language Flagship Proficiency Initiative PACE project at the University of Minnesota conducted ACTFL proficiency tests with over 2300 students in all levels of seven languages from 2014–2017. This study looked at data collected from over 1,100 students of French and Spanish during the three years of the PACE project to determine correlations between pre-university language study and proficiency and between placement in the program and language proficiency, and also looked at the most proficient learners in terms of their language background and placement. The session presents our results which can have an impact on language offerings at the high school level and might also affect curricular emphases at the post-secondary level. Dan Soneson is the Director of the Language Center in the College of Liberal Arts and is the Principal Investigator on the Flagship PACE project. He served as the managing editor of the IALLT Journal for Language Learning Technologies from 2010-2017, and has been a leader in language learning and technology for over 20 years. Arthur "Tripp" Strawbridge is a PhD student in Hispanic Linguistics in the Department of Spanish and Portuguese Studies. His primary research interest is Spanish Second Language Acquisition, especially within the context of study abroad. Carter Griffith has an MA in Second Language Education from the University of Minnesota. He is working as a data specialist with the PACE project to compile and process PACE data. This presentation is cosponsored by the CLA Language Center. Paesani, K., Menke, M., & Truman, L. (2018, November 1). "Understanding Teacher Discourse Around Multiliteracies Pedagogy." Over the past two decades, scholars and practitioners have been exploring ways to apply multiliteracies (ML) principles and practices to postsecondary language programs. Yet adopting new teaching paradigms can be challenging for teachers: The few studies that have investigated how teachers learn about and implement ML pedagogy underscore the long-term nature of teachers' conceptual development and their difficulties in applying conceptual knowledge in instruction. In this presentation, we discuss a qualitative case study that contributes to this line of research. Specifically, we investigate whether and how concepts related to communicative language teaching (CLT) (e.g., comprehensible input, language functions, affect) are manifested in teacher discourse around ML pedagogy. Findings indicate that participants' discourse reflected CLT concepts to differing degrees, despite similarities in their teaching histories. We conclude with implications of the study's findings for socializing FL teachers into ML pedagogy. Kate Paesani is the CARLA Director and affiliate Associate Professor at the University of Minnesota. Her research is focused on literacy-based curriculum and instruction and foreign language teacher development. Lauren Truman is a doctoral candidate of Hispanic Linguistics. Her research interests include bilingualism, language and identity, language maintenance, and language policy. Her work focuses on the sociolinguistics of Spanish and Maya in the Yucatan and bilingual education policy in the United States. Bigelow, M., Peng, P., & Yang, A. (2018, October 18). "Complicating Culture in Chinese Language Classes." This presentation will share findings about ways Chinese language teachers explore topics of culture in US school settings. Our analyses of naturally-occurring data from a summer institute point to new ways of integrating culture and language that make spaces for using Chinese to promote inquiry into self, particularly in terms of interculturality and understanding differences. We will discuss the challenges and insights we discovered when striving to complicate reductionist or celebratory approaches to culture through critical pedagogies. Implications for curriculum and instruction involve shifting the focus of culture from knowledge of China to building cultural awareness and intercultural competence to promote social justice in K-12 schools. Martha Bigelow is Professor of Second Language Education in the Department of Curriculum and Instruction. Her research spans the fields of education, applied linguistics, and cultural studies. Ping Peng is a Ph.D. student in Second Language Education in the Department of Curriculum and Instruction. She is also a Chinese immersion teacher in the Minnetonka Public Schools. She devotes most of her professional time to identifying, designing, and implementing effective and practical teaching methodologies and strategies for Chinese immersion teaching based on the daily teaching experience. Alice Yang is a Ph.D. student in Second Language Education in the Department of Curriculum and Instruction. Her study interests are language teaching pedagogy, teacher education, language assessment, and international education. This presentation is cosponsored by the Second Language Education program in the Department of Curriculum and Instruction. Stone, K., & Mathieu, C. (2018, October 3). "World Language Teacher Preparation and the edTPA: How Alignment and Incongruities Can Inform Continuous Improvement." This presentation will describe a research project that explored World Language and Classical Language teacher candidate edTPA data spanning four years. A brief overview of the World Language edTPA and the SLE post-baccalaureate teacher licensure program will be given, followed by a description of the research process. Based on analysis of candidate scores and written portfolio responses, the presenters will share their findings around trends in teacher candidate performance, alignment of candidate performance with program goals, and how incongruities in the data have led to changes in practice for the coming year. Karla Stone is a Lecturer and the License Program Lead in the Second Language Education program in the Department of Curriculum and Instruction. Cory Mathieu is a Ph.D. student in the Second Language Education program. Her research primarily focuses on secondary Spanish immersion pedagogy, materials development, and teacher education. She teaches several classes in the department, including some for the Dual Language and Immersion certificate program. She also works as a Clinical Supervisor for the World Language and ESL post-baccalaureate teacher licensure program. Carillo Cabello, A., Matos, F., & Salazar Pozos, O. (2018, September 20). "Blended Learning and Online Coaching." This study examined the use of online coaching as a pedagogical intervention for the development of speaking skills and its connection to assessment practices. Using quantitative and qualitative data, we analyzed self-assessment ratings of oral performance and class participation of 54 Spanish learners. In addition, the study aimed to identify and explicate any differences in ratings of these categories based on pedagogical interventions, instructor's ratings, and learners' perceptions of the interventions. Results revealed that different technology tools triggered contrasting reactions to speaking engagement rules and approaches to task completion. Implications of the results and implementation will be discussed. Adolfo Carrillo Cabello is a Professional Development Specialist at the CLA Language Center. His research interests include intercultural communicative competence, foreign language pedagogy, materials development, and online and distance learning. F. Matos is a Senior Lecturer in the Department of Spanish and Portuguese Studies. Her interests are teacher development, online and hybrid/blended teaching, and course design. Olga Salazar Pozos is a second-year graduate student at the Department of Spanish and Portuguese Studies. Her research interests include 19th and 20th century Latin American literature, contemporary Mexican literature, postcolonial studies, and human rights. Mathieu, C., & Gopalakrishnan, A. (2018, April 25). "Mixed Methods Research in Second Language Education." This CARLA presentation is the culmination of a semester-long independent study on mixed methods research in language learning and teaching. Although mixed methods research has gained traction since the paradigm wars of the 1990s, it is still adopted relatively infrequently in research in the broad field of language learning and teaching. In this presentation, we will first discuss our understanding of the underlying paradigms and purposes of mixed methods research. We then argue that this research approach offers important affordances for the field of language learning and teaching research given the multi-dimensionality of the constructs that are studied. We note, therefore, the gap between the potential of mixed methods research and the reality of its scarcity in current literature. We conclude the presentation by describing our upcoming study that will look more closely at this gap by speaking directly with researchers to understand why they do or do not adopt mixed methods in their own work. Cory Mathieu is a PhD student in Second Language Education in the department of Curriculum and Instruction. Her research focuses on materials use and development and content and language integration in secondary Spanish immersion programs. Anuradha Gopalakrishnan is a PhD student in Second Language Education in the department of Curriculum and Instruction. Her research interests include multilingual pedagogies, third language acquisition and foreign language education. Her multilingual and multicultural experiences shape her research work and influence her teaching. Mathieu, C. (2018, April 19). "Materials Design and Use in a Secondary Spanish Immersion Classroom." The successful integration of content and language is a persistent challenge in content-based language instruction contexts such as dual language and immersion (DLI) classrooms. Although previous scholarship has explored a variety of factors that affect DLI teachers' abilities to integrate content and language in their pedagogy, none of this work has focused on the potential affordances and constraints of the classroom materials that these teachers employ. Moreover, very little classroom-based language learning materials use research has examined the relationship between the design of the materials themselves and how they are used in the classroom. Operating under an overarching question of how language-focused modifications to DLI materials might offer affordances for more frequent and effective content and language integration, this study set out to build a local theory for how the design of DLI materials related to how they were mobilized by the teacher and students in one ninth-grade Spanish immersion social studies classroom. In this presentation, I share findings from classroom observations, teacher interviews and materials analysis that illustrate a possible relationship between materials design and materials use, highlighting in part how materials design features can support or inhibit an intended pedagogical paradigm and/or curriculum. I will also present implications for DLI pedagogy, materials development for content-based instruction and teacher education. Corinne (Cory) Mathieu is a PhD student in Second Language Education in the department of Curriculum and Instruction. Her research focuses on materials use and development and content and language integration in secondary Spanish immersion programs. She teaches in the dual language and immersion certificate program and works as the graduate assistant for the K-6 initial licensure program with a focus on dual language and immersion education at the University of Minnesota. Mack, S. & Menke, M. (2018, March 8). "International, but How? Considering Second Language Teaching and Learning from the Perspective of the Internationalizing Teaching and Learning Framework." Second language classes are often assumed to be inherently 'international,' and have the potential to contribute significantly to institutional goals of producing 'globally competent' citizens. Upon closer examination, however, what international exactly means is not always clear, and course materials and learning outcomes often rest upon hegemonic discourse and communicative standards that place the U.S. student experience at the center. In this presentation, the speakers will explore how the Internationalizing Teaching and Learning (ITL) framework (Clifford 2009; Hovland 2009; Leask 2009; University of Minnesota 2013) provides a conceptual structure and pedagogical method for addressing these issues. From a cross-disciplinary perspective, we will explore the question of how an internationalized curriculum is defined, what this framework can offer language teachers at the individual level, and what benefit it can have at the course and programmatic level. The presentation will include key considerations for effectively integrating the ITL framework in multi-section, multi-instructor contexts as well as share preliminary findings from data gathered in a course organized using the ITL model. This presentation is cosponsored by the Department of Spanish & Portuguese Studies and the Internationalizing Teaching and Learning Faculty Cohort Program. Stemper, K. (2018, February 22). "Indigenous Language Education: Practitioners' Experiences with Teacher Certification Policy." This project investigates the relationship between education policies and process regarding teaching certification and the teaching and learning of Indigenous languages. According to the 2017 Report of Teacher Supply and Demand in Minnesota's Public Schools—a report to the MN legislature prepared by the Minnesota Department of Education—six school districts / charter schools in MN reported not being able to fill all vacancies for Ojibwe language teachers (data was not provided for Dakota). Additionally, in FY 2014, FY 2015, and FY 2016, there were zero Ojibwe or Dakota world language licenses issued in MN, and fewer than five special permissions issued for 2015-2016. As there is a growing desire to stabilize and revitalize Indigenous language and culture (Treuer, 2010), greater attention needs to be placed on the processes for qualified individuals to become licensed to teach in schools, whether in a 'world language' or language immersion context. By creating a narrative of the unique circumstances facing districts, schools and speakers in increasing the number of licensed Ojibwe and Dakota teachers, this presentation illuminates a critical aspect of education policy that impacts Indigenous language education. Kathryn Stemper is a Ph.D. student of Second Languages Education in the Department of Curriculum and Instruction. She is a White, non-Indigenous researcher who focuses on how language-in-education policy positions the teaching, learning, and use of Indigenous languages in K-12 schools. Ready, C. & Fuentes, M. (2018, February 8). "Incorporating the Literary and the Everyday in the Foreign Language Classroom." The Foreign Languages and the Literary in The Everyday (FLLITE) approach, developed from Joanna Luks's The Literary in the Everyday, is an heuristic for curriculum development from the beginning levels to advanced foreign language study. The FLLITE approach attempts to bridge the language/literature divide that is still prevalent in foreign language curriculums and textbooks by bringing together "the literary," with its range of playful, metaphorical, and non-conventional ways of making meaning, and "the everyday," which includes the language used for daily communication. This talk will address the key concepts of the FLLITE approach and how to incorporate these concepts into the foreign language classroom. Additionally, we will look at lesson plans that combine the literary and the everyday to help students grapple with layers of meaning when interpreting and producing diverse kinds of texts. Carol Ready is a PhD student in the Department of Spanish and Portuguese Studies specializing in Hispanic Linguistics focusing on the sociolinguistics and language contact of Spanish and Arabic in Spain. She participated in the FLLITE project as a COERLL (Center for Open Educational Resources and Language Learning) collaborator at the University of Texas at Austin where she worked with foreign language educators to develop lessons and teaching materials based on the FLLITE approach. Marcelo Fuentes is a PhD candidate in the Department of Spanish and Portuguese Studies, and he analyzes the depictions of Muslims by Christians in the medieval and early modern literatures of Iberia. He was also a COERLL collaborator at the University of Texas at Austin. This presentation is cosponsored by the Department of Spanish & Portuguese Studies. Paesani, K. & Menke, M. (2018, January 23). "Making Multiliteracies Real: A Tool for Analyzing Instructional Materials." Recent scholarship has foregrounded literacies, defined as a socially situated process of making meaning from texts, as a necessary curricular goal for collegiate foreign language (FL) programs, and multiliteracies pedagogy as a viable approach to develop students' FL literacies. Yet as more programs adopt this framework, additional research is needed to understand how it is applied through materials design and implementation. In response, this study documents the process of implementing a tool for analyzing literacies-based teaching materials. Using the knowledge processes framework (Kalantzis, Cope, Chan, & Dalley-Trim, 2016) as an analytical lens, the researchers and a group of experienced teachers examined 25 lessons targeting interpretive communication from two courses in a lower-level Spanish curriculum. In this presentation, we report empirical data illustrating the results of our analysis as well as teachers' perceptions of the process. We furthermore discuss conceptual and pedagogical factors contributing to our findings and implications for supporting FL teachers in the creation and revision of literacies-based instructional materials. Hanson, S. (2017, November 9). "Lessons from Inside Greek Refugee Camps." MELP Teaching Specialist Stephanie Hanson spent her summer break volunteering in refugee camps on the Greek island of Lesvos. In this forum, she shares her experience as a member of the Boat Refugee Foundation's psychosocial support team, focusing on English as a Foreign Language and other educational resources available to refugees in the camps. Information and recommendations about more opportunities to support refugees abroad will also be provided. Stephanie Hanson is a Teaching Specialist at the Minnesota English Language Program (MELP) at the University of Minnesota. This presentation is cosponsored by the Minnesota English Language Program. Eslamdoost, S. & Lai, Y-J. (2017, October 31). "EFL Policy and Practice in Iran: Conflicts in Teacher Agency and Identity Construction." Drawing on the scholarship of language policies and teacher identity (Hamid & Nguyen, 2016), this presentation examines the dynamic nature of teacher identity construction among EFL instructors in Iran. It also looks at the impact of micro and macro level policies on the ever-changing teacher roles and power in relation to their institutions and students. Fairclough's (2015) approach to language and power was used to closely analyze classroom interactions where Iranian EFL instructors demonstrated their agency to negotiate and legitimize teacher expertise, sociocultural expectations towards teaching and learning, and institutional and broader Islamic ideologies. Teachers' agentive identities were mediated by the practices at local level and institutional context and educational policies at broader level. Learners' expectations and the rules imposed by the authorities led some teacher participants to challenge against their desirable teacher agentive identities. Teachers interaction with policies in centralized Iranian institutional contexts complicated their desired and performed agentive identities in relation to language learners, institutions, and larger Iranian sociocultural contexts. Samaneh Eslamdoost is a PhD candidate in Teaching English as a Foreign Language at the University of Allameh Tabataba'i in Tehran. She is currently a visiting scholar in the Second Language Education program at the University of Minnesota. Her research focuses on how EFL teacher identities are (re)constructed in interaction with language and education policies in centralized Iranian educational contexts. She also looks into the conflicts facing EFL teachers in those contexts and how they respond to the challenges to their professional identities. Yi-Ju Lai is a PhD candidate in the Second Language Education program at the University of Minnesota. Her research addresses the language socialization processes and practices of multilingual international students into academic discourse communities. Her work focuses on the socialization interactions where communicative forms and norms, institutional ideologies, and memberships are negotiated and constructed among participants. Gill, J. (2017, October 19). "Think on Your Feet: Debate as a Critical Exercise." What are some effective ways to make critical thinking a focus in our language classes? Debate is a central component to critical thinking, and including it can help American students in foreign language classes as well as international students in ESL classes who may not have had a cultural or educational background in critical thinking. This presentation will demonstrate several examples of formal and informal debate, the scaffolding needed, and ways to evaluate the critical thinking that debates build. Presenter: Jon Gill is a Teaching Specialist at the Minnesota English Language Program (MELP) at the University of Minnesota. Suvorov, R. & Carrillo Cabello, A. (2017, September 13). "Development of Language Learner Autonomy in Adaptive Learning Systems." This study investigated affordances offered by adaptive learning systems (ALS) for the development of L2 learner autonomy, as well as potential constraints that prevent such development. Using the tenets of activity theory (Basharina, 2007; Blin, 2004; Engeström, 1999, 2001; Lantolf & Thorne, 2007), this study examined the use of two ALS by 35 learners of Spanish enrolled in beginning and intermediate-level Spanish courses. The data comprised learners' responses to an online survey, semi-structured interviews, and focus groups administered at two different points in the semester. Results revealed that the division of labor and the rules embedded in the design of the two ALS offered both affordances and constraints for developing learner autonomy. Presenters: Dr. Ruslan Suvorov is Language Technology Specialist at the Center for Language & Technology, University of Hawaiʻi at Mānoa. His research interests lie at the intersection of applied linguistics and instructional technology and design, with the focus on language assessment, eye tracking, and blended and online learning. Dr. Adolfo Carrillo Cabello is Professional Development Specialist at the CLA Language Center, University of Minnesota. His research interests include intercultural communicative competence, foreign language pedagogy, materials development, and online and distance learning. Lai, Y-J. (2017, September 26). "Constructing Academic Voices in Language Socialization in Academic Contexts." This presentation discusses the socialization process and practice of constructing and negotiating academic voices among multilingual international students in a graduate-level research presentation class at a U.S. Midwestern university. It takes up Bakhtin's (2006) notion of voice and van Leeuwen's (2007) concept of legitimation to closely analyze the language-mediated socialization activities and practices addressing why students need to do this in this way and how students negotiate and redefine certain linguistic forms and non-verbal expressions to construct their voices as legitimate members. The lens of voice also uncovers subtle changes in socialization practices at the micro level that reflect and are shaped by macrosociopolitical ideologies. This presentation suggests that language socialization into academic discourse practices and communities is a dynamic, linguistically and socio-culturally mediated process involving negotiation of institutional ideologies and disciplinary memberships. It also challenges current discussion of what the field conceptualizes as "successful" and "failed" outcomes of language socialization. Presenter: Yi-Ju Lai is a PhD candidate in the Second Language Education program at the University of Minnesota. Her research addresses the language socialization processes and practices of multilingual international students into academic discourse communities. Her work focuses on the socialization interactions where communicative forms and norms, institutional ideologies, and memberships are negotiated and constructed among participants. Barnett, C. B. (2017, April 25). "Showcasing the Power of Transformative Learning: A Look at Students’ Perspectives on French-Speaking North America." The Francophone communities of the United States are not often incorporated into the K-16 French curriculum. If present, they are typically situated as existing only in the past with the contemporary beliefs and practices often remaining "invisible" to students. During this presentation, the researcher will briefly outline a semester long undergraduate course organized around both historical and present-day Francophone New England and Louisiana. Structured reflection journal entries and a culminating interview were the qualitative data analyzed for each student to determine to what extent transformative knowledge (i.e., learning that goes beyond the acquisition of basic knowledge and changes an individual's perspective of the world and his or her place within it) occurred from the beginning of the semester to the end. Presenter: C. Brian Barnett is a Lecturer of French and Director of French Language Instruction at the University of Minnesota and has taught undergraduate-level novice, intermediate, and advanced French courses and graduate-level pedagogy courses. He has interests in the American varieties of French, immersion education, children's literature, materials and curriculum development, and styles- and strategies-based instruction. Cushing_Leubner, J. (2017, April 12). "Who's the Teacher Now? A Pedagogy of Youth-Led Participatory Action Research for Heritage Language Education." Youth-led participatory action research (YPAR) is an approach to teaching and learning that blurs research, pedagogy, and actions that seek transformational justice. This talk describes one example of a YPAR project in a high school Spanish as a heritage language class in which multilingual Latinx youth drew on their own study of U.S. Latinx social justice history to become teachers to multilingual 3rd-5th graders. They first drew on their own academic studies to design and facilitate learning circles, then utilized these experiences to lead language teachers and administrators in professional development around community expectations for linguistic and cultural representation in the schooling experiences of multilingual youth of color. Ultimately, this talk examines YPAR as a key pedagogy of possibility for multilingual youth to claim, reclaim, and sustain languages other than English whose maintenance has been restricted in the predominantly English language environment of U.S. schools. Presenter: Jenna Cushing-Leubner is a PhD candidate and doctoral dissertation fellow in the department of Curriculum & Instruction (Second Languages Education) and has spent the last four years working with teachers to forge multilingual learning spaces for youth from multilingual communities. She has worked extensively with teachers of English as an additional language and Spanish for native speakers to develop classes and programs that emphasize positive ethnic and linguistic identity, social justice, youth research, and transformative teaching. Engman, M. (2017, March 28). "Revitalizing Language, Reframing Expertise: An Ecological Study of Language in One Teacher-Learner's Ojibwe Classroom." Due to centuries of settler colonial policies intended to oppress and erase Indigenous peoples in what is now the United States, most teachers currently involved in Ojibwe language education efforts are learners themselves with varying formal training in language and pedagogy. This phenomenon of the 'teacher-learner' (Hinton, 2003) receives little attention though it is of crucial importance to the growing number of classroom-based revitalization programs. This talk presents a qualitative analysis of language and interaction, focusing on patterns of language use and social practices within one teacher-learner's Ojibwe classroom. A better understanding of how language is used in this context and its connection with broader discourses of Indigenous language and education contributes to language revitalization research, informs professional development to support teacher-learners, and strengthens heteroglossic Indigenous identities. Presenter: Mel Engman is a PhD candidate and doctoral dissertation fellow in the department of Curriculum & Instruction (second language education) and she is a White, non-Indigenous learner of Ojibwemowin. Her research examines the use of heritage and Indigenous languages in a variety of schooling contexts, and she works with language teachers and administrators to develop curriculum and instructional materials. Vanek, J. (2017, March 7). "Adult English Language Learners, Untrained Teachers, and the Language of Digital Literacy: Early Findings from a Design-Based Research Study." The presentation describes one aspect of a larger dissertation project exploring digital literacy and language learning for adult migrants in the US. The study used Design-Based Research to elucidate the challenges adult ELLs face as they attempt to build digital literacy skills in community-based organizations staffed by untrained teachers (i.e., AmeriCorps members). The presentation addresses a central finding concerning the role of English language and literacy in the teachers' instructional strategies. More specifically, the data show that as the participant teachers collaboratively defined instructional challenges and iteratively built an instructional resource to support their computer skills instruction, they developed an awareness of their role as language teachers. Discussion includes observations about the implications for this shift on their instructional strategies and, more broadly, recommendations for support of novice or untrained teachers working in widely mixed-level classroom settings with linguistically diverse student populations. Presenter: Jen Vanek is a Doctoral Dissertation Fellow and Doctoral Candidate in Second Language Education program at the University of Minnesota. Jen's research is informed not only by her academic work in SLE but also nearly twenty years of experience working as an adult English language and literacy teacher, curriculum developer and teacher educator. Caldas, B. (2017, February 21). "Beyond Poly, Multi, Trans, Pluri, Bi: What Do We Talk About When We Talk About Translanguaging?" The term translanguaging has become a hot topic in the field of bilingual education in the US. A close analysis shows this term has been conceptualized in similar ways under different names. This presentation aims to examine and juxtapose these conceptualizations, the contributions to bilingual education and language learning to open a discussion on the need for changes that include the complexities of minoritized language practices. Presenter: Blanca Caldas is an assistant professor in Second Language Education and Elementary Education—College of Education and Human Development at The University of Minnesota Twin Cities. Cosponsored by the Second Language Education Program in the Department of Curriculum and Instruction. David, S. (2017, February 7). "Emergent Practices in Translingual Pedagogy: Teachers Learning to Facilitate Collaborative Translation." This presentation will describe a qualitative professional development study in which four 8th grade language arts teachers spent five weeks learning and implementing an approach to translingual pedagogy called TRANSLATE (Teaching Reading And New Strategic Language Approaches To English learners). TRANSLATE is adapted from small group guided reading, and describes specific steps as well as flexible strategies for guiding students to collaboratively translate short passages from grade level texts to improve reading comprehension. This study framed the teachers' initial experimentation with the TRANSLATE protocol as an emergent social practice, shaped by the ongoing negotiation of embodied routines, material tools and spatial arrangements, and participants' reflexive understandings about these practices. In this presentation I will focus specifically on how teachers perceived and responded to translingual activity when they did not share a language background with their students, and on how each teachers' participation in collaborative translation became more strategic as the team co-constructed a locally responsive vision of the purpose of translingual pedagogy in a language arts class. Presenter: Sam David is an assistant professor of second language education at the University of Minnesota. He recently completed his doctoral work at Vanderbilt University, focusing on the literacy development of culturally and linguistically diverse students in mainstream classrooms, and on teacher learning of translingual and culturally responsive pedagogies. Prior to pursuing the doctorate, Sam worked as a bilingual special education teacher in upper elementary grades in Brooklyn, NY. Clements, C. (2017, January 25). "Tech Tools for Teaching Language: What Really Works?" This presentation will highlight the results of a literature review of research into effectiveness of online tools for Computer Assisted Language Learning (CALL). Though the measures used by researchers to determine "effectiveness" varied, there was some consensus about which tools were most helpful based on the research evidence. The presenter will share her synthesis of which tools work best for language acquisition, and will provide an overview of the effective, centrally-supported tools available to UMN language learners and instructors. Presenter: Catherine Clements teaches English as a Second Language in the Minnesota English Language Program at the University of Minnesota and Computer Assisted Language Learning at Hamline University. Diemer, S., & Brunner, M-L. (2016, November 10). "Intercultural Skype Communication: Two Views from the Field." 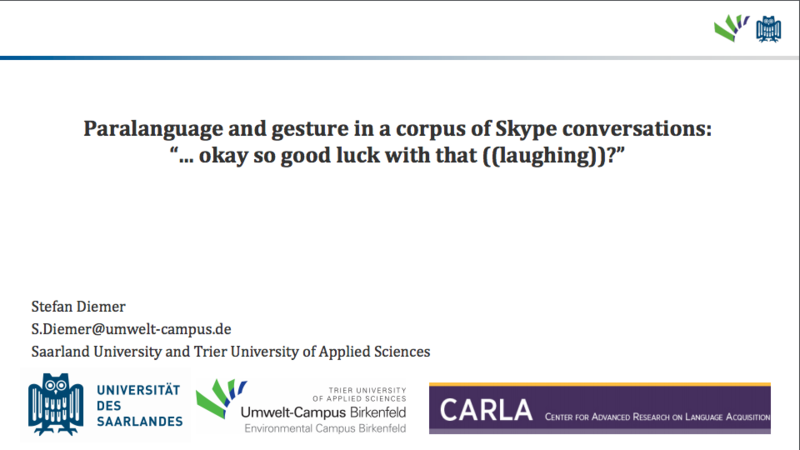 The University of Minnesota's Institute of Linguistics has partnered with CARLA to offer two short talks by guest scholars Dr. Stefan Diemer and Dr. Marie-Louise Brunner from Saarland University, Saarbrücken, Germany. The presenters are co-founders and partners of Teaching Solutions Brunner & Diemer partnership corporation, consulting with companies, educators, and government institutions on intercultural and educational issues, and offering a broad range of educational opportunities focused on intercultural and multilingual teaching methods and web-based learning. "... Okay so good luck with that ((laughing))?" Presenter: Stefan Diemer is professor of international communication and digital business at Trier University of Applied Sciences and associate professor of linguistics at Saarland University, Saarbrücken, Germany. He is head of the team compiling CASE, the Corpus of Academic Spoken English, a corpus of international Skype conversations. 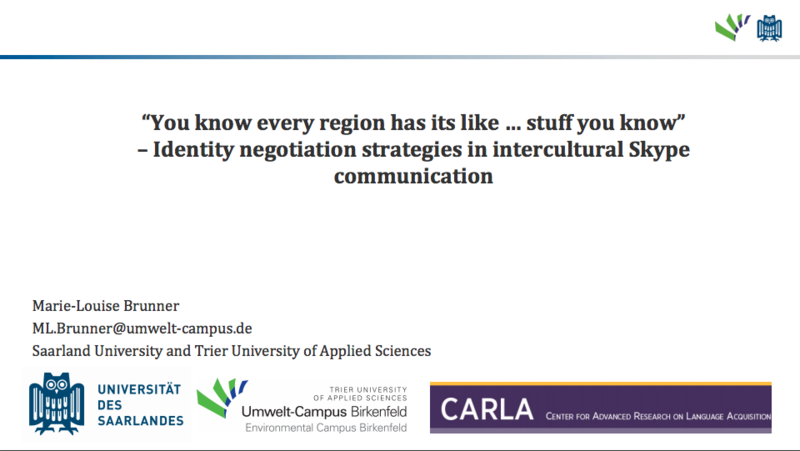 "You know every region has its like ... stuff you know"
Presenter: Marie-Louise Brunner is PhD researcher and head of the intercultural communication programme at Trier University of Applied Sciences and lecturer in the department of English linguistics at Saarland University, Germany. This is event is sponsored by the Institute of Linguistics and cosponsored by CARLA, PACE Project, and the Minnesota English Language Program. LaScotte, D. K. (2016, November 8). "Enacting Voices: An Analysis on the Complexity, Accuracy, and Fluency of Heteroglossic Speech." The present study supports the idea of heteroglossia and its contributions to language learning in SLA theory. Bakhtin's (1934/1981) theory of heteroglossia differs from variety and register in that when learning a language, one internalizes the voices of others. Viewing interlanguage through a heteroglossic lens, it is possible that these voices in heteroglossia may have an effect on learner language. This study analyzes two learners' interlanguage through a heteroglossic lens to explore whether these distinctive voices in heteroglossia have an effect on the complexity, accuracy, and fluency of L2 learners' language. Presenter: Darren Keith LaScotte, MA in TESOL, is adjunct faculty in the Minnesota English Language Program and in the University of Minnesota's Dept. of Curriculum & Instruction. His research interests include language education, learner language, and language variation across social contexts. Cosponsored by the Minnesota English Language Program and the Second Language Education Program in the Department of Curriculum and Instruction. Peters, B., & Anderson, M. (2016, November 1). "Teaching Multilingual Learners in University Classes: A Survey of Faculty." Faculty teach a variety of multilingual students across the many disciplines at the University of Minnesota. Working with international students or others who do not speak English as their first language, faculty encounter challenges related to students' language ability as well as the many benefits of working with a cross-cultural and multilingual class. In Spring 2016, the Minnesota English Language Program (MELP) conducted a survey to learn more about what faculty and staff perceive as the benefits and challenges of supporting multilingual students. Approximately 1,500 survey respondents shared their views and provided recommendations to enhance training and support options for faculty and staff at the University of Minnesota. In this session, the presenters will provide an overview of the faculty survey results as well as implications for best practices in supporting multilingual learners. Presenters: Bethany Peters, M.A., is a Teaching Specialist and Faculty Liaison at the Minnesota English Language Program (MELP) in the College of Continuing Education at the University of Minnesota. Michael Anderson, Ph.D., is the Director of English Language Programs in the College of Continuing Education at the University of Minnesota. Cosponsored by the Minnesota English Language Program. Searls, K. (2016, October 27). "Making the Most of It: Exploring Learner Agency in a Referential Communication Task Sequence." The presenter will discuss how two Korean English learners shaped interaction with the interviewer during a Question and Retell referential task sequence. Learner agency is explored through qualitative linguistic analyses of questions asked and patterns of language adopted from the interviewer. This linguistic data is surveyed for divergence from a "typical" performance through learners' strategic behavior and resistance to the task. The discussion contributes to an understanding of referential communication as social interactions that require participants to negotiate intersubjectivity as well as transfer information (Yule, 1997). Presenter: Kyle Searls, MA in TESOL, is adjunct faculty in the Minnesota English Language Program. His background includes teaching EFL in Argentina and South Korea; he also holds licences to teach ESL and Spanish in Wisconsin. His interests include SLA and learner identity. Gielissen, T. (2016, October 11). "Collaborative Revitalization: Negotiating for Pronunciation and Grammar in Ojibwe." Due to the crushing effects of hundreds of years of racial and linguistic colonialism, Ojibwe is now considered an endangered language, and the number of native speakers dwindles a little more each year. This has sparked a wave of language revitalization efforts, which have attempted to bring the language back into use. Unfortunately, prospective Ojibwe learners often struggle to find meaningful language practice opportunities, and due to the unavailability of immersion schools, adult learners often learn individually. In this study, the presenter examines her own language negotiation with a fellow graduate student after 11 weeks of Ojibwe study. Her findings show that, despite their low language ability, the learners were able to notice and correct each other's Ojibwe pronunciation and grammar. While this small case study, of course, cannot be generalized to language revitalization at large, it suggests that, even in a community in which native speakers become scarcer each year, the learning of the Ojibwe language can be continued through collaboration between language learners. Presenter: Theresa Gielissen is a recent graduate of the MA in TESOL program and currently works at the Minnesota English Language Program as an adjunct teaching specialist. Paesani, K. (2016, September 28). "Interpersonal Speaking as a Pathway to Foreign Language Literacy Development." In recent years, the concept of literacy has emerged as a common goal for collegiate foreign language curricula. Whereas traditional definitions of literacy focus on students' ability to read and write, modern definitions entail the ability to interpret and create meaning in a range of sociocultural contexts through interaction with authentic target language texts of various genres. This broader definition suggests that literacy development encompasses all language modalities—reading, writing, listening, viewing, and speaking—and that these modalities overlap as learners interact with literary-cultural content to communicate meaningfully. In this presentation, I expand this definition and use illustrative examples to help argue that interpersonal speaking is a viable pathway to foreign language literacy development and increased engagement with literary-cultural content at all levels of the undergraduate foreign language curriculum. Presenter: Kate Paesani is the new Director of CARLA. Her research focused on literacy-based curriculum and instruction and foreign language teacher development. Before coming to CARLA she was an associate professor and director of basic French courses at Wayne State University. Cosponsored by the CLA Language Center and the Second Language Education Program in the Department of Curriculum and Instruction. Tarone, E., & Wicker, S. (2016, September 14). "Exploring Spanish Learner Language: New CARLA Multimedia Activities." The presenters will show the newest installment to the learner language project: multimedia interactive materials featuring two learners of Spanish, one a heritage learner and the other a foreign language learner. Using Exploratory Practice (Allwright & Hanks, 2009) as a framework, the presenters will engage participants in website activities that show how to explore and document characteristics of the Spanish language the different learners produce. For example, the group will explore and measure key differences in lexical variety and syntactic complexity when the learners did the same task orally and in writing. The group will consider together reasons for such learner differences and possible pedagogical responses. Elaine Tarone is a Distinguished Teaching Professor Emerita at the University of Minnesota, and past Director of CARLA. She has published extensively in the field of second-language acquisition. Shawna Wicker is a graduate student in the MA in TESOL program. Her background and interests include Hispanic linguistics, SLA, teaching Spanish in the US, and teaching EFL in Italy and China. Paesani, K. (2016, April 6). "Building Synergies in 21st Century Language Programs through Literacy Development and Teacher Professionalization." To overcome challenges facing language programs in the 21st century, a focus on synergies is crucial. In this presentation, I discuss synergies that are embodied in two strands of empirical research: one focusing on students' foreign language literacy development; the other on graduate student teacher professionalization. Using the multiliteracies framework as theoretical grounding for both studies, I explore how an understanding of learner perceptions, literacy development, and teacher practice can create stronger relationships between research and practice, language competencies and content knowledge, secondary and post-secondary educational contexts, and foreign languages and other disciplines, and thus enhance language teaching and learning. I conclude by considering how these kinds of synergies are reflected in and can be expanded upon through projects and professional development efforts at the Center for Advanced Research in Language Acquisition. McEwan Davis, J. (2016, April 4). "The Usefulness of Accreditation-Mandated Assessment in U.S. Community College Language Programs." U.S. college foreign language educators are under increasing pressure to use assessment and evaluation for program improvement. Institutional accreditation, in particular, has tried to make program assessment an integral part of educational delivery with the ambitious aim of increasing educational effectiveness across U.S. post-secondary institutions. The productive usefulness of accreditation-driven assessment, however, is in question. Research suggests, rather, that institutional assessment requirements result in perfunctory, compliance-oriented assessment activity and fail to achieve meaningful educational change. How have these mandates impacted college-level language education? This presentation reports on a national survey of programmatic assessment activities in U.S. community college language programs. The study investigated the extent to which educators are using assessment productively (e.g., to develop materials or modify instruction) and whether they have the needed resources to conduct assessment for educational innovation and improvement purposes. Gopalakrishnan, A., & Kautz, B. (2016, March 29). "Developing Communicative Resilience in Language Learners." Language learners need communicative resilience: the ability to persist in unrehearsed interactions even in the face of communication breakdowns. The present study analyzes the effect of continuous and explicit instruction of communication strategies on the communicative resilience of intermediate level adult learners of German. The treatment in this study included weekly input in the form of core vocabulary and training activities. A comparison of pre- and post-tests show a substantial rise in the learners' ability to manage communicative breakdowns and interact successfully despite them. This study has implications for teaching interpersonal communication skills to language learners and in improving their self-confidence while engaging in unrehearsed interactions in a second language. Anuradha Gopalakrishnan is a first year PhD student in the Department of Curriculum and Instruction. Her research interests include learner language in multilingual settings. Beth Kautz coordinates and teaches intermediate German (German 1003) at the University of Minnesota. She is interested in new pedagogical approaches and has implemented blended learning, integrated performance assessments, and content-based instruction in her courses. Goertler, S. (2016, March 28). "Using Technology to Improve Study Abroad: Building on Shively (2010)." As foreign language enrollments decrease (MLA, 2015) and the Generation Study Abroad Initiative (Institute of International Education, 2014) demands a doubling of study abroad participation, language programs need to improve the effectiveness and the articulation of study abroad in the overall curriculum. Shively (2010) proposed a model for pragmatic learning, which uses technology to improve pragmatic learning before, during, and after study abroad participation. Building on Shively, Goertler (2015) argued that technology cannot only improve pragmatic learning, but technology's affordances can help prepare students for study abroad, maximize language and culture learning while abroad, and assist in integrating students returning from study abroad. Based on these notions the German program at Michigan State University has introduced three technology-mediated curricular innovations to increase study abroad participation and enrollment, and improve the effectiveness of and articulation of our curriculum. (1) By integrating technology-enhanced modules about our study abroad destinations into our second-year curriculum prior to students going abroad, we have increased participation in study abroad and stakeholders report that students are better prepared for study abroad. (2) During our year-long study abroad program, students completed analysis tasks and reflective blogs to increase noticing of language and culture gaps. While students did notice stereotypical morphosyntactical and intercultural communicative errors, many of the errors leading to greater communicative challenges were not noticed. (3) To better integrate our study abroad returnees into the curriculum, we revised our fourth-year language course to include a virtual exchange with students at an institution located in one of our study abroad destinations. This post study abroad virtual exchange allowed students to continue to use German at a high level and stay connected to German-speaking communities. For one of the two year-long study abroad program returnees this exchange had a significant positive impact on her challenges with reverse culture shock and reintegration into our curriculum and institution. Carlson-Lombardi, A., Kautz, B., Lake, E., & Ruf, H. (2016, March 23). "Implementing Integrated Performance Assessments (IPAs) in University Foreign Language Teaching." Instructors from the Departments of German, Scandinavian and Dutch and Spanish & Portuguese share their experiences implementing Integrated Performance Assessments (IPAs) in first-year and second-year foreign language courses, including the challenges and successes. Angela Carlson Lombardi is the Coordinator for Spanish 1003 and has taught both language and culture in the Department of Spanish and Portuguese Studies. She has also conducted Global Seminars abroad. Her interests are developing authentic cultural materials for the classroom with blended online and face to face instruction. Beth Kautz coordinates and teaches intermediate German (German 1003). She is interested in new pedagogical approaches and has implemented blended learning, integrated performance assessments, and content-based instruction in her courses. Liz Lake is a Senior Teaching Specialist in the Department of Spanish & Portuguese Studies. She has taught beginning and intermediate-level hybrid and technology-enhanced Spanish courses for over nine years. Helena Ruf is Director of Language Instruction in the Department of German, Scandinavian and Dutch. She also coordinates and teaches first-year German and is interested in creating innovative materials for classroom use and assessment. Anderson, A. M., & Menke, M. (2016, March 7). "Development of Academic Writing Skills in the Spanish Major." In this presentation, we explore the writing development of undergraduates in the Spanish major. The presentation begins with a comparison of student writing with self-reported faculty expectations, highlighting incongruities between the two and the potential impact of under-defined criteria in assignment descriptions and rubrics. From there, we explore the linguistic forms and expressions students use to fulfill one of these criteria—adoption of a critical and analytical stance—via a function-form analysis. Ana Maria Anderson is a Ph.D. student in Hispanic Linguistics in the Department of Spanish and Portuguese Studies. While she has done work in a variety of areas of linguistics, including studies of Metaphor and of Second/Third Language Acquisition of Spanish and Portuguese, her main focus is on Language Contact between Galician and Spanish in Galicia. Mandy Menke is an Assistant Professor of Hispanic Linguistics and Director of Language Programs in the Department of Spanish and Portuguese Studies. She regularly researches topics related to both second language acquisition and foreign language pedagogy, at both the university and K-12 levels. Cosponsored by the Department of Spanish and Portuguese Studies and the CLA Language Center PACE project. Dillard, B. (2016, February 23). "Language Instructors Learning Together: Using Lesson Study in Higher Education." Research on professional development overwhelmingly suggests that instructor learning is maximized through sustained involvement in active learning. This type of participation allows instructors not only needed time to absorb and conceptually integrate new ideas, but more importantly, to practice that new knowledge in the contexts relevant to their work (Garet, Porter, Andrew & Desimone, 2001; Guskey, 2000; Opfer & Pedder, 2011). It can be challenging to design these types of meaningful environments for language instructors in higher education, particularly in the less commonly taught languages (LCTLs) where individuals may be sole representatives of their language. In response to this challenge, the author brought together a small inquiry group composed of college instructors of Arabic, Japanese, and Korean (for a total of five individuals). Drawing ideas from both the exploratory practice model (Allwright, 2009) and the jugyou kenkyuu "lesson study" framework (Yoshida, 1999; Lewis, 2004), an inquiry cycle was designed to engage the participants in collaborative investigation of collective problems of practice. Participants first used video recordings and classroom observations to focus their attention on student learning; subsequently, transcripts of group conversations about classroom observations served to stimulate awareness of moments of teacher learning. This paper uses an activity theory framework to address the following question: How can elements of an instructor inquiry group such as interaction patterns, transcripts of previous group meetings, and videos of classroom interactions serve to mediate language teacher conceptual development? Analysis of interview and inquiry group meeting data suggests the efficacy of using transcripts from prior meetings as "mirrors" or "second stimuli" (Engeström & Sannino, 2010) to mediate further insight into one's teaching practice. Further, and importantly for professional development work with instructors of LCTLs, data suggest that the multi-language nature of the group itself was a mediating factor towards language teacher conceptual development. Presenter: Beth Dillard is a Ph.D. candidate in the Second Language Education program in the College of Education and Human Development. Her research interests include teacher learning through teacher-led inquiry, the academic language development of language learners, and content-language integration in language classrooms. Beth was selected as a CARLA Fellow for 2014-2015. Boeckers, D. (2016, February 10). "Mobile-Assisted Language Learning Situated in Bloom's Taxonomy—So Much More Than Flashcards!" Mobile-assisted Language Learning can sometimes get a bad reputation from critics of limited use of apps. This sessions counters that critique with an exploration of apps (iOS, Droid, Chrome) that weaves through Bloom's Taxonomy. In particular, we will emphasize the highest level of Bloom's updated Taxonomy–creating. Highlighted tasks are all contextualized in the L2 classroom and attendees will have access to a resource webpage chock-full of handouts, screencasts and rubrics. Presenter: Daryl Boeckers trains in-service and pre-service teachers at the Learning Technologies Media Lab in the College of Education + Human Development. His background is teaching 15 years of secondary Spanish. Daryl teaches, writes, conferences, publishes and gives talks about how mobile technologies affect language teaching and learning. Meyers, C. (2016, February 5). "The 'Mirroring Project': A Contextualized and Integrated Approach to Pronunciation Teaching." Although the field of pronunciation teaching has moved from the audio-lingual era of "listen and repeat" to more interesting and fun activities, it's still often de-contextualized. In addition, it may be taught from a bottom-up perspective (sounds through intonation) or as discrete pronunciation features. The "Mirroring Project," in which students mimic not only the language but also the non-verbals of an intelligible spoken model, is one way to contextualize pronunciation practice, as well as integrate pronunciation features into one practice activity. This interactive presentation will take you through the steps of this process so that you can apply it to your own ESL or foreign language classroom context. Presenter: Colleen Meyers is an educational specialist at the Center for Educational Innovation. In 2007, she trained university-level instructors in teaching pronunciation as a Fulbright scholar in Turkey. Tarone, E. (2014, November). "Minnesota's multilingualism and English learner education: A historical perspective." Many languages have been spoken in Minnesota, and English did not gain ascendancy here until sometime around the Louisiana Purchase in 1803. This presentation offers a brief history of languages spoken in Minnesota over these last 200+ years, and reviews initiatives in English learner education that have been employed here. Particularly over the last 50 years, a strong focus on the education and professionalization of teachers of English as a second language has played a key role in considerably improving the quality of English learner education in this state. Today, Minnesota has established a strong national and even international reputation of leadership in English learner education, across K-12, adult education, and post-secondary contexts. Some key principles of this work will be reviewed, and directions for future efforts will be briefly outlined. Presenter: Elaine Tarone, Director of the Center for Advanced Research on Language Acquisition and Distinguished Teaching Professor of Second Language Education at the University of Minnesota. Kuhlke, O. & Mullins, M. (2014, April 21). 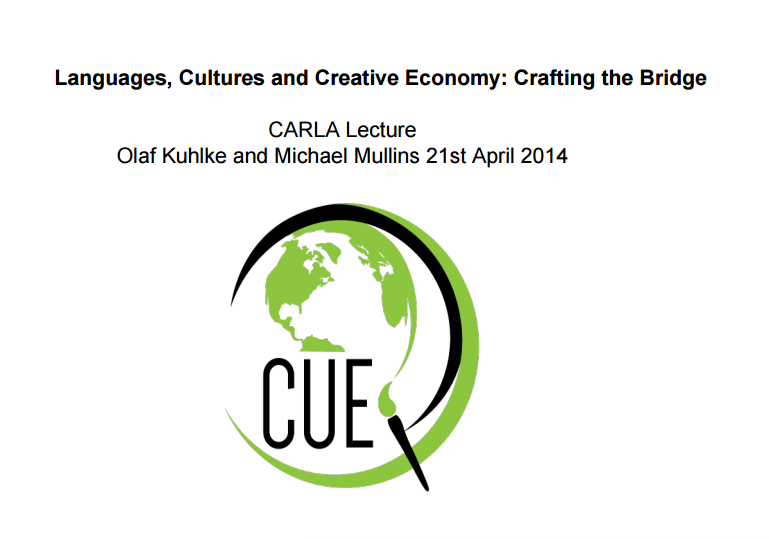 "Languages, Cultures, and Creative Economy: Crafting the Bridge." Murphy-Judy, K. (2014, March 7). "Weather or Not! Easy Technology Solutions for Online Language Teaching." Another snow day? Learning doesn't have to screech to a stop when the University closes. This workshop will highlight a range of tech tools (GoogleDocs, pencasts, screen captures, lecture captures) that can keep student learning progressing, regardless of the weather! The session will also show easy to replicate examples of active learning tasks that can be used for hybrid learning and flipped classrooms. 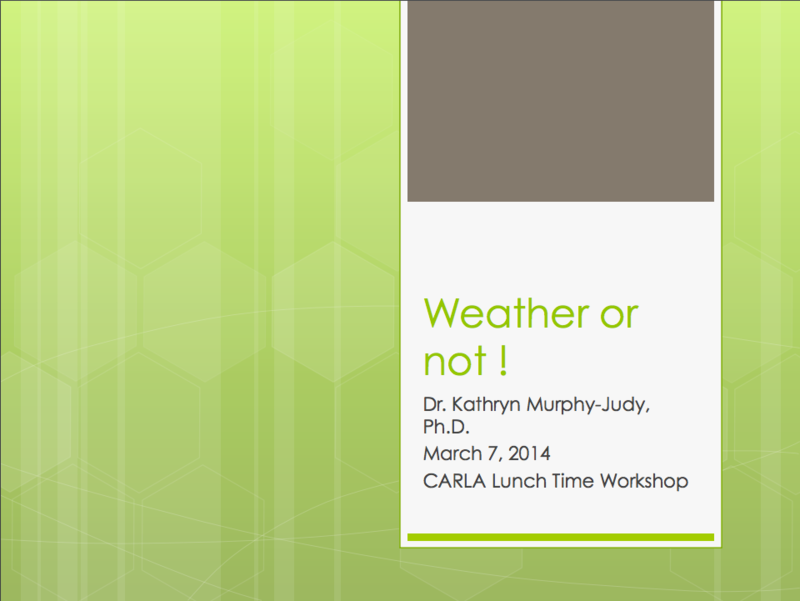 Presenter: Kathryn Murphy-Judy is an Associate Professor of French at Virgina Commonwealth University. Her work in new technologies and media for second language acquisition combines her interest as a medievalist in the role of new media in social reconfigurations with her passion for understanding and improving language learning. She has edited two CALICO monographs on technology and language education along with many articles, chapters, and presentations. She currently is working with the BOLDD Collaboratory, a group of over thirty online designers and instructors, to create and improve basic online language learning. Clements, C. & Steinhagen, G. (2014, February 11). 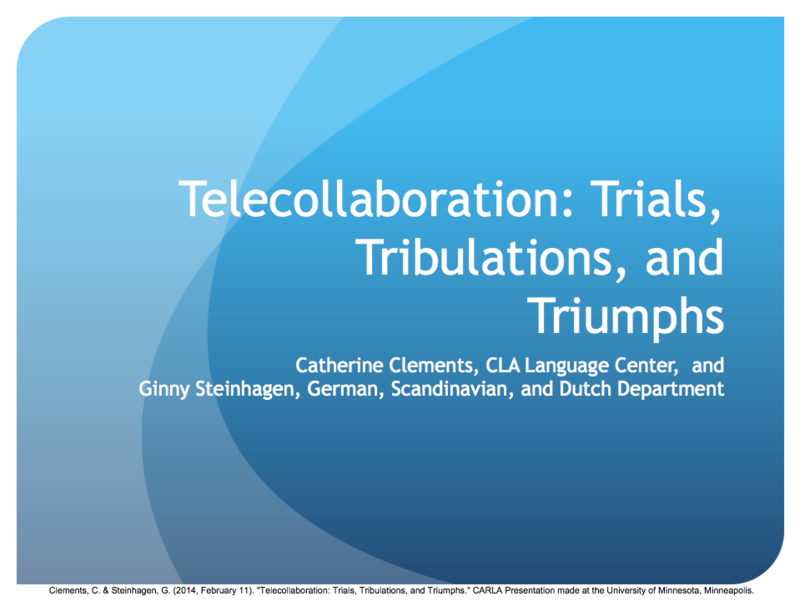 "Telecollaboration: Trials, Tribulations, and Triumphs." Telecollaboration, or "class to class" virtual exchange between students in different countries who are learning each other's native language, helps students to gain authentic skills in the target language. At their best, these exchanges provide students with invaluable language and cultural learning in a fun, unique way. At their worst, however, the exchanges can be de-motivating and dispiriting for students and instructors alike. This presentation will examine best practices for establishing, arranging, and maintaining telecollaborations with complementary universities around the globe, and will provide ideas and guidelines for instructors who are interested in starting a telecollaboration. Presenters: Catherine Clements is a teaching specialist and TandemPlus Coordinator for the CLA Language Center at the University of Minnesota. She has been arranging international telecollaborations for the University since 2010. Ginny Steinhagen is a senior lecturer in German, and the German 1004 coordinator at the University of Minnesota. She has done tandem exchanges in German 1003, 1004, and 3011 classes. Tarone, E. (2013, October 15). 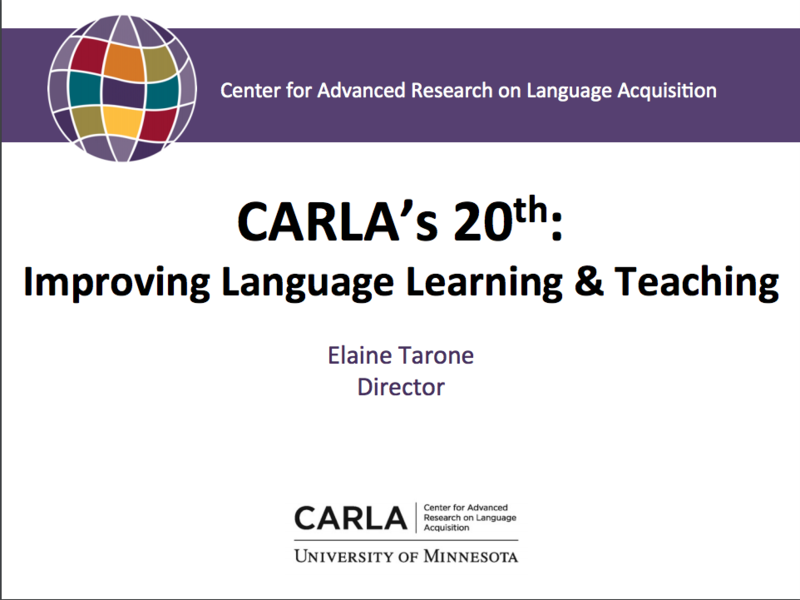 "CARLA's 20th anniversary: Improving language learning and teaching." This 20th Anniversary presentation presents a case for multilingualism and highlights the work that CARLA has done to support language teaching and learning since the center was founded in 1993. Wolfram, W. (2012, November 2). "Diversity awareness in lLanguage learning: A proactive model." Though language diversity is an essential fact of sociolinguistic life, its status in language teaching varies greatly—from the unapologetic adoption of a linguistic subordination ideology to the dismissal of language variation as a pedagogical non-issue. In this presentation, an argument is made for the systematic recognition of language variation in teaching and learning a second or other language, and the integration of linguistic diversity as a central component of teacher training and language instruction. The presentation discusses some needed research on language awareness in language instruction and a theoretical and practical model for integrating language variation into language instruction. The model is based on innovative sociolinguistic engagement endeavors that include the development of specific curricular materials to educate teachers and students about language variation as well as broad-based public education efforts that employ the production of TV documentaries, the construction of museum exhibits, and the development of other public dissemination venues for disseminating formal and informal information about language variation. 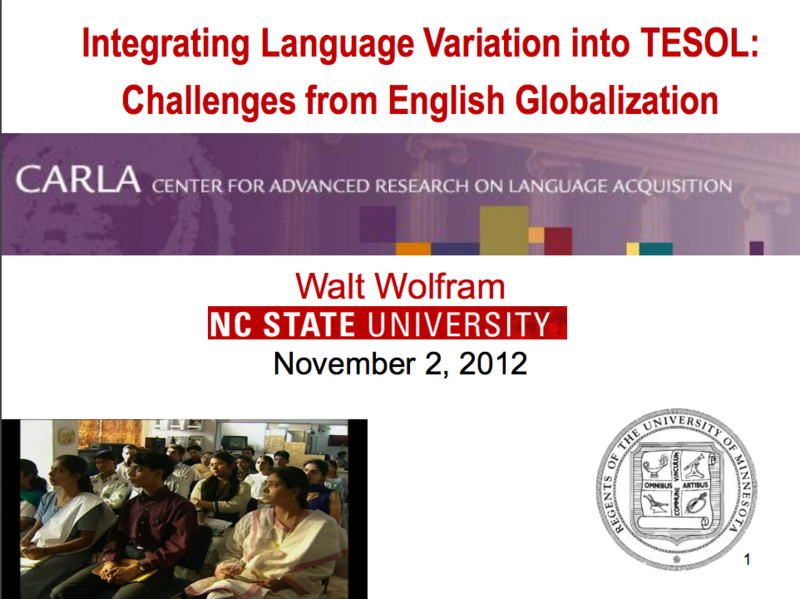 Presenter: Walt Wolfram is William C. Friday Distinguished University Professor at North Carolina State University, where he also directs the North Carolina Language and Life Project. He has pioneered research on social and ethnic dialects since the 1960s and published more than 20 books and more than 300 articles. Over the last two decades, he and his students have conducted more than 2,500 sociolinguistic interviews with residents of North Carolina and beyond. Current research supported by National Science Foundation grants have included the longitudinal development of African American English during the first 20 years and the emergence of Hispanicized English in the Southeastern United States. He has received numerous awards and has served as President of the Linguistic Society of America, the American Dialect Society, and the Southeastern Conference on Linguistics. Cosponsored by the Department of Curriculum and Instruction, MA in English as a Second Language, and MinneTESOL. Cohen, A. (2012, November 29). "Resources for the learning of Spanish available at CARLA." The session is intended to familiarize teachers of Spanish language with the two websites available at CARLA for assisting learners in mastering Spanish: "Dancing with Words" – about Spanish pragmatics, and The Spanish Grammar Strategies Website. Participants are encouraged to bring their laptops and iPads along. We will go through both websites and discuss applications to ongoing classes, as well as future ones. The main intention is to enhance the learners' experiences in both learning and using Spanish grammar, and in their ability to be appropriate in the comprehension and production of pragmatics in Spanish language interactions. 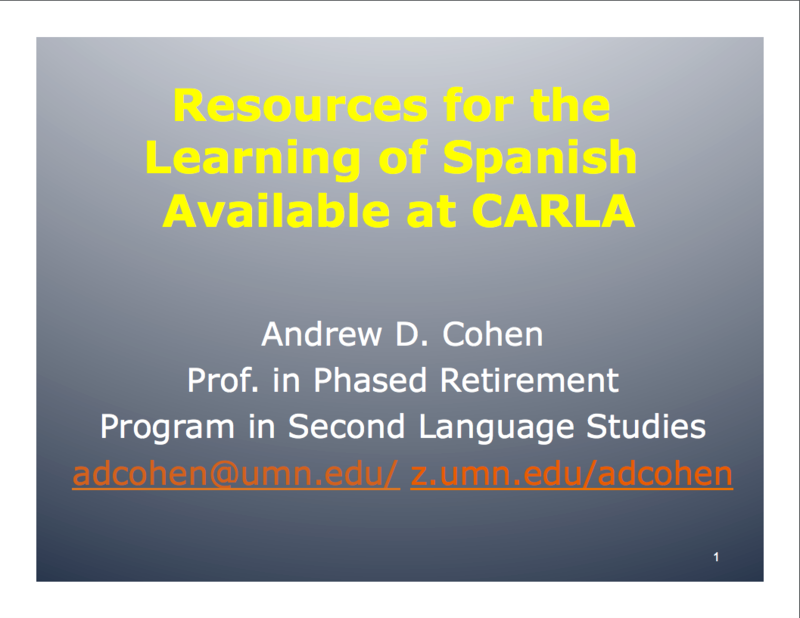 Presenter: Andrew Cohen, Professor in Phased Retirement, Program in Second Language Studies, led the development of these resources as part of CARLA's Title VI Language Resource Center funding. This presentation is sponsored by CARLA, Department of Spanish and Portuguese, and HALLA (Hispanic and of LusoBrazilian Linguistics Association). Clementi, D. (2012, April 3). "Outcomes of Participation at Concordia Language Villages: Implications for Teaching and Learning World Languages." There is little disagreement that summer language experiences benefit learners but questions about "how" and "how much" are often difficult to answer. Findings from a study Donna Clementi conducted for her dissertation on the outcomes of student participation in Lac du Bois, the French Language Village of Concordia Language Villages provide insights into these benefits. The purpose of Dr. Clementi's study was to describe outcomes of participation in Lac du Bois in terms of: (a) language acquisition; (b) cultural understanding; (c) global-mindedness; and (d) personal development. Her results highlight important implications for world language instruction both within and beyond Concordia Language Villages. Presenter: Donna Clementi, Dean of Teacher Seminars at Concordia Language Villages, is a long-time presenter at CARLA summer institutes. She was a member of the ACTFL Performance Assessment Unit Pilot Project and the Wisconsin Guide to Curriculum Planning team and is a frequent presenter for the STARTALK program. She serves as the national advisor to CARLA's assessment project. Garrett, N. (2012, January 20). "An Ambitious Agenda for Languages Across the Curriculum." The speaker will set an agenda for "Languages Across the Curriculum", perhaps the most promising direction in language education today. The integration of world language use into every field of study on campus will require attention to several factors, including: the creation of a virtual national center to manage instructional resources, improved professional development for instructors, use of a range of different curricular models, integration of language study abroad with language study across the disciplines, and intelligent uses of technology to sustain learning. Presenter: Nina Garrett served as the Director of Language Study at Yale until her retirement. She has been president of IALLT and of the CALICO Board and still speaks, writes, and consults nationally on the integration of CALL, FL pedagogy, and SLA theory. She is the national advisor to the CARLA LCTL project.